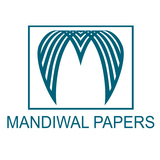 Welcome to the wonderful world of handmade paper and paper products at Mandiwal Papers established as an organization in 2013 but in the field of handicrafts we were involved from 1994. We started in 1994 with two peoples in a company and a small room of 100 sq. ft. as office and now we have grown to more than 70 people in the company with more than 8000 sq. ft. and more space in other facilities. We have in-house printing, binding, coloring and other facilities. At Mandiwal Papers, we have a dedicated team of designers and artisans based in India. We take pride in making handmade paper products in aesthetic, eco-friendly, biodegradable and fully recyclable quality at affordable prices. We make use of simple hand-operated machines that assist the human hands. Also, new techniques are inherited to serve the customers with new and unique designs and products. We are owe to supply you with quality handcrafted paper products like diaries, journals, stationery compendiums, letterhead/envelope sets, gift boxes, gift bags, gift wraps, wine bottle bags, photo albums, photo frames, wraps, wine bottle bags, photo albums, photo frames, greeting cards etc. Handmade paper has the advantage of being 100% wood free which makes it the most eco-friendly form of paper around. It is also 100% recycled. Handmade paper is excellent for writing as well as printing. It has greater tensile, bursting, tearing and double-fold strength compared to conventional paper. Apart from all this it looks great, handmade paper is fashionable, it’s up market, its classy! Handmade paper seems to be the perfect thing to have come around in terms of environment friendliness. There are no chemicals used in the manufacture of our handmade paper. The paper is solar dried, so no energy wastage. No trees are cut to make such paper, the pulp used to make the paper is derived from Cotton Fabric Rags, this makes it 100% eco-friendly and 100% natural. So handmade paper cuts down on pollution, its saves trees (and wildlife) thus contributing to a much healthier environment.